May 24, 1980 - Food Not Bombs cofounder Brian Feigenbaum was arrested at the May 24th Direct Action to Stop Seabrook Nuclear Station in New Hampshire inspiring bake sales to raise money for Brian's defense and the Bake Sales to Buy a B-1 Bomber. March 26, 1981 - Food Not Bombs shares food at its first action protesting the interlocking directors at the Bank of Boston and local nuclear industry by and dressing as hobos and setting up a soup kitchen outside the stock holders meeting at South Station with the message that their policies could cause another Great Depression. Over 50 people came to eat. 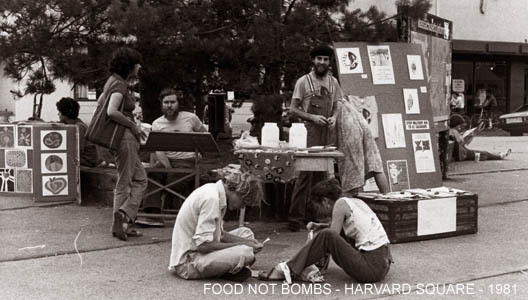 August 20, 1981 - Food Not Bombs shares food and outside a weapons bazaar at Boston University the day after we spray-painted the outline of "dead" bodies on the ground, stenciled mushroom clouds with the word "Today?" and wheat-pasted "War is Murder for Profit" posters along the route that the weapons buyers and sellers would take from their hotel to the conference hall. August 6, 1981 - First Food Not Bombs march for nuclear disarmament co sponsored by Cambridge City Council leaves from Cambridge, Massachusetts City Hall traveling to Draper Laboratory near M.I.T. where a volunteer burned the Boston white pages as an example of all the people who would die in a nuclear attack like the bombing of Japan. October 30, 1981 - First night that the first Food Not Bombs banner was used while sharing food at a protest this time at a torch light march against Bush speaking at M.I.T. December 20, 1981 - "Walk For Peace," organized by Food Not Bombs marches down Massachusetts Avenue through Harvard Square on one of the coldest days of the winter. May 2, 1982 - First "Free Concert for Nuclear Disarmament" in Senot Park, Cambridge, Massachusetts. May 7, 1985 - Food Not Bombs helps organize the occupation the J.F.K. Federal Building in Boston with Pledge of Resistance in a protest against the war against El Salvador and provided food to many of the 500 protesters that sat in in the lobby. October 29, 1985 - Food Not Bombs organizes the "Boston Pee Party" to protest President Regan's new drug testing laws mailing urine collected outside the Federal Building in Boston. October 23, 1986 - Boston Food Not Bombs organizes the "Welcome to Kenmore Square" meals to defend the rights of the homeless during the American League play offs and World Series between the Red Sox and Mets. March 11 - 20, 1988 - San Francisco Food Not Bombs participates in it's first action by feeding the protesters at the "Reclaim the Test Site" action at Mercury, Nevada gate of the Nevada Nuclear Test Site. Over 8,000 people participated and nearly 3,000 were arrested during the action making it a record for most civil disobedience arrests in a single protest. A giant banner saying "Food Not Bombs" was placed across ground zero held down with rocks. August 15, 1988 - The first nine Food Not Bombs volunteers arrested for sharing meals at the entrance to Golden Gate Park in San Francisco, California. August 22, 1988 - Police arrest 24 volunteers for "making a poetical statement" by sharing free food with the hungry at Haight and Stanyan Streets in San Francisco. September 4, 1988 - 54 Food Not Bombs volunteers arrested "for making a political statement" by sharing free food at the entrance to Golden Gate Park in San Francisco, California. September 6, 1988 - Mayor Art Agnos issues San Francisco Food Not Bombs a "temporary" permit to share food at the entrance to Golden Gate Park. September 27, 1988 - San Francisco Police memo written by officer Richard Holder reporting that he was able to gained information about an October 15th protest against the war in El Salvador by wiretapping the Food Not Bombs telephone. October 15, 1988 - Food Not Bombs co-founder Keith McHenry arrested and beaten sharing food to protesters against the war in El Salvador. June 28, 1989 - Food Not Bombs starts to share meals 24 hours a day in solidarity with the homeless at their Tent City Protest outside San Francisco City Hall. July 16, 1989 - Eleven Food Not Bombs volunteers arrested sharing food at San Francisco City Hall in defiance of a court order because of the groups support of the Tent City Protest. September 11, 1989 - San Francisco Department of Public Health issues first Permit to Operate numbered D2258 to certify Food Not Bombs field kitchen at Golden Gate Park. October 5, 1989 - San Francisco Food Not Bombs feeds the survivors of the Loma Prieta Earthquake in Civic Center Plaza sharing meals to the police and ending this round of arrests. March 13, 1990 - San Francisco Department of Public Health issues second Permit to Operate numbered D2260 to certify Food Not Bombs field kitchen at Civic Center Plaza. June - July, 1990 - Food Not Bombs provides food at the Earth First! base camp during Redwood Summer in the forests of Northern California. July 19, 1990 - The San Francisco Recreation and Parks Department deletes the permit process for sharing free food in city parks in Resolution 15585 Section 1, subsection IV. September 13, 1990 - Food Not Bombs co-founder Keith McHenry beaten and injured in an elevator of police headquarters in San Francisco. June 24, 1991 - San Francisco Police rush up to a rally against health care budget cuts smash Gloria La Riva's head into stone wall as the officers beat and injured Food Not Bombs co-founder Keith McHenry as he was request signatures on post cards asking to be placed on the next Recreation and Parks Department agenda. January 17, 1991 - San Francisco Food Not Bombs starts to feed hundreds at Civic Center Plaza protesting Desert Storm as the giant Food Not Bombs banner travels up the Bay Bridge and through out the city as tens of thousands blockaded the Federal Building for five days and others blockaded the Pacific Stock exchange. Food Not Bombs groups provide meals at local actions in a number of other cities in the United States and Canada. March 22, 1991 - Food Not Bombs wins first civil contempt of court case before Judge Daniel Hanlon in San Francisco and then police arrest Richard Edmondson, Keith McHenry, Eric Warren and Tom Osher during a police riot where those jailed were accused of stealing a gun from officer Broadnick. March 3, 1992 - First anti- police brutality protest one year after the video taped beating of Rodney King. Van Jones's first arrest as San Francisco march nearly reached police headquarters. September 1, 1992 - First edition of Food Not Bombs - How to Feed the Hungry and Build Community published by New Society Press in Philadelphia, Pennsylvania. October 7 - 11, 1992 - First International Food Not Bombs Gathering held in San Francisco where the three principles of Food Not Bombs were adopted - Free vegetarian and vegan meals without restriction, dedication to nonviolent direct action and every group autonomous with out leaders and using consensus to make decisions. November 1, 1992 - The first Food Not Bombs Radio Network radio program "Puerto Rico: Nation, State or Colony?" produced by Richard Edmondson. September 2, 1993 - 15 Food Not Bombs volunteers arrested outside San Francisco City Hall to stop the groups effort to protest the mayors quality of Life Enforcement Matrix Program against the homeless and charged with felony conspiracy to commit a misdemeanor. November 26, 1992 - First Homes Not Jails occupation of hotel at 90 Golden Gate Avenue and empty business in the Tenderloin of San Francisco to protest mayor Frank Jordan's anti-homeless policies as he came to have his photo taken carving a turkey at Glide Memorial Church on Thanksgiving Day. January 4, 1994 - Food Not Bombs co-founder Keith McHenry arrested on his first "Three Strikes" charge after being attack by the mayors film commissioner Nick Roomel while calling a towing company to retrieve the Food Not Bombs truck. January 24, 1994 - United Nations Human Rights Commission letter announcing an investigation into human rights violations against Food Not Bombs by the government in the United States. May 10, 1994 - Food Not Bombs co-founder Keith McHenry arrested for felony assault with a deadly weapon against a public official at San Francisco City Hall and possession of stolen property consisting of 24 Berkeley Farms Dairy milk crates no facing 25 years to life in prison. July 11, 1994 - Eight arrested for felonies share food at Civic Center Plaza on the opening day of Food Not Bombs co-founders "Three Strikes" trial in San Francisco. September 26, 1994 - All nine City Councilors of the City of Cambridge Massachusetts adopts resolution in support of Food Not Bombs. October 20, 1994 - Arcata Food Not Bombs volunteers issued first summons ordering the group to stop feeding the hungry. October 28, 1994 - Amnesty International letter about arrest and violence against Food Not Bombs volunteers declares all those arrested would be considered "Prisoners of Conscience" and would work for their unconditional release if convicted. February 15, 1995 - Food Not Bombs co-founder Keith McHenry settles California Three Strikes Case ending possibility of a 25 to life sentence. June 15 - 27, 1995 - Second International Food Not Bombs Gathering held in San Francisco during the 50th Anniversary Celebration of the United Nations. San Francisco make over 600 arrests during the gathering. Food Not Bombs sets up first Indymedia Center to report on the gathering. February 25, 1996 - Robert Norse Kahn convicted and sentenced to to 59 days in jail for handing out food to the homeless without a permit after being arrested October 1993 outside San Francisco City Hall. October 5, 1997 - "The UnFree Trade Tour " starts at Long Haul in Berkeley traveling to 60 cities in the United States and Canada calling for direct action to shut down the next World Trade Organization summit in North America. November 28, 1999 - Food Not Bombs helps organize the action against the World Trade Organization meeting in Seattle and provides food to the protesters. December 15, 1999 - Los Angeles Food Not Bombs organizer, Dan DiPasquo, was arrested by the Pershing Square park rangers and the Los Angeles Police Department. December 26, 1999 - Seven more Los Angeles Food Not Bombs volunteers arrested sharing food at Pershing Square. February 15, 2001 - 19 year old Long Island Food Not Bombs volunteer Connor Cash arrested by the F.B.I. and indicted on the charge of arson conspiracy in first false terrorism case of a Food Not Bombs activist. February 15, 2003 - Food Not Bombs chapters in hundreds of cities shares meals to thousands of people protesting against the U.S. invasion of Iraq communities all around the world. April 19 - 21, 2003 - Melbourne Food Not Bombs provides meals to the protesters outside South Australia's Baxter Immigration Detention Centre near Port Augusta. September 10 to 14, 2003 - Food Not Bombs volunteers from around the world share food outside the Ritz Carlton at the start of the World Trade Organization's meeting in Cancun, Mexico and provides vegan meals in downtown Cancun to the protesters all week. August 1, 2003 - Denver Police Raid Food Not Bombs House without Provocation and eight are arrested. October 8, 2003 - Food Not Bombs activists arrive in Milan, Italy at the start of "The Drop Bush Not Bombs Tour." November 20-21, 2003 - Food Not Bombs volunteers from all over America provide free meals to the protesters at the actions against the Free Trade Area of the Americas Summit in Miami, Florida. Cooks attacked by police. March 28, 2004 - Tampa Food Not Bombs volunteers James Dunson and Lily Lewis, both USF students, were also arrested on charges of trespassing in Massey Park. April, 18, 2004 Tampa Food Not Bombs volunteers Amberly Banks, James Dunson, and Christopher Ernesto were arrested and jailed on charges of trespassing on public property. May, 10, 2004 Tampa city government agrees to drop all charges against Food Not Bombs and lets the group share food and literature. December 7, 2004 - The F.B.I. Joint Terrorism Task Force memo written on investigation of Denver Food Not Bombs and volunteer Sarah Bardwell before the national political conventions in Boston and New York. May 18, 2005 - "Since when did feeding the homeless become a terrorist activity? " asked ACLU Associate Legal Director Ann Beeson. "When the FBI and local law enforcement target groups like Food Not Bombs under the guise of fighting terrorism, many Americans who oppose government policies will be discouraged from speaking out and exercising their rights." August 9, 2005 - Food Not Bombs volunteers start to provide the food at Cindy Sheehan's Camp Casey in Crawford, Texas outside Bush's summer home. August 31, 2005 - Hartford Food Not Bombs volunteers Dave Rozza and Ross Harmon arrive in New Orleans and start feeding the hungry displaced by Hurricane Katrina. American Red Cross gives out the Food Not Bombs toll free number to anyone seeking food. November 13, 2005 - Food Not Bombs volunteer Timur Kacharava stabbed to death by 8 to 10 neo-nazis while sharing meals for Food Not Bombs on Ligovsky Prospekt in St. Petersburg, Russia. December 7, 2005 - In the most serious case of framing Food Not Bombs volunteers as terrorists FBI agents arrest Chelsea Gerlach, Bill Rodgers, Kendall Tankersley, Kevin Tubbs, Daniel McGowan and Stanislas Meyerhoff most of whom were volunteering with Food Not Bombs while under investigation by informants in "Operation Backfire." January 13, 2006 - Food Not Bombs volunteers Eric McDavid Zachary Jenson and Lauren Weiner arrested by F.B.I. charged with Conspiracy to damage and destroy property by fire and an explosive after the F.B.I. paid an informant $65,000 to frame them. Eric McDavid was sentenced to 19 years even though he was innocent of any crimes. February 14, 2006 - Eleven Food Not Bombs volunteers arrested and tortured in the Philippines while hitchhiking from Buguias to Sagada, Mountain Province. The Food Not Bombs campaign SAGADA 11 wins their freedom after 11 months in prison. March 8, 2006 - In a guest lecture at the U.S. Law and National Security course at the University of Texas School of Law, FBI Supervisory Senior Resident Agent G. Charles Rasner listed in his powerpoint Indymedia, Food Not Bombs, and the Communist Party of Texas as three of the ten Terrorist Watch groups they were infiltrating in Austin. June 11, 2006 - Food Not Bombs Activist Peggy Lee Kennedy Arrested at the meal in Venice, California. January 4, 2007 - Food Not Bombs volunteer Helen Hill was murdered by a random intruder at her home in New Orleans. Helen started theHalifax, Nova Scotia, Canada chapter and volunteered with New Orleans Food Not Bombs both before and after Hurricane Katrina. April 4. 2007 - Eric Montanez, a member of Orlando Food Not Bombs arrested sharing food at Lake Eola Park in downtown Orlando Florida. June 27, 2007 - Six members of Orlando Food Not Bombs were arrested for drumming outside a fundraiser for Orlando Mayor Buddy Dyer in protest of his support for an ordinance that bans the serving of food in public parks. They were arrested on charges of violating a City of Orlando noise ordinance even though it is not an arrestable offense. August 11 - 20, 2007 - First International Food Not Bombs Gathering outside the United States held near Transcarpathia, Ukraine at the No Border camp. November 25, 2007 - Dipepi Free Food Gang/Jakarta Food Not Bombs organize huge Really, Really Free Market on Buy Nothing Day with people coming for all over Indonesia to participate. July 5, 2008 - Reykjavik Food Not Bombs provides meals at the Eat the G8! Solidarity action in Iceland. August 29, 2008 - Joanne M. Smith, Judge of Ramsey County District Court signed the warrants for raids on the Food Not Bombs cook houses in Minneapolis. Food Not Bombs houses raided by F.B.I. and Homeland Security the day before the Republican National Convention arresting 8 volunteers on Patriot Act charges as terrorists. March 6, 2009 - Jonathon Gerhardt with the New Mexico Environment Department issue Albuquerque Food Not Bombs with $3,000.00 Fine and Arrests. March 13, 2009 - East Bay Food Not Bombs volunteer Tristan Anderson shot in the head with a tear gas projectile from around 60 meters by Israeli forces during a demonstration in the West Bank village of Ni lin. March 28-30th 2008 - Food Not Bombs gathering in Nashville draws over 150 volunteers who agree to start more Food Not Lawns gardens and seek ways like Homes Not Jails to address the dramatic increase in food prices and the housing foreclosure crisis. September 26, 2008 - Federal judge Gregory Presnell in Orlando, Florida rules -- for the first time in the USA -- that sharing food with hungry and homeless people in public spaces is expressive conduct protected by the First Amendment. May 3, 2009 - Food Not Bombs volunteer Abe Bobman arrested sharing food in Middletown, Connecticut. October 3, 2009 - Connecticut General Statute 19A-36 changed to allow Food Not Bombs to share meals without interference by the state as a result of the arrests of the Middletown Food Not Bombs volunteers. December 17, 2009 - The 11th Circuit Court of Appeals in Atlanta hears arguments on whether sharing food with hungry and homeless people in public spaces is expressive conduct protected by the First Amendment. Orlando Food Not Bombs was represented by lawyer Jacqueline Dowd. May 23, 2010 - Boston Food Not Bombs celebrates the 30th Anniversary of the movement at Soupstock on the Boston Commons. Concerts also in Europe, Australia and other areas of the world. July 6, 2010 - The 11th Circuit Court of Appeals in Atlanta rules against Orlando Food Not Bombs claiming the city can restrict the groups right to free expression. August 30, 2010 - The 11th Circuit Court of Appeals in Atlanta vacates its July opinion in favor of the City of Orlando and grants a rehearing en banc on Feburay 15, 2011. February 15, 2011 - The 11th Circuit Court of Appeals in Atlanta hears case of Orlando Food Not Bombs. February 17, 2011 - Fort Lauderdale, Florida Police Department raids the local Food Not Bombs house in the departments campaign to stop the group from sharing in Stranahan Park. April 12, 2011 - The 11th Circuit Court of Appeals in Atlanta rules that the City of Orlando can limit Food Not Bombs to the sharing of meals to twice a year per park. Email us your additions. Tell us the date your chapter first shared food, your participation in major protests or dates of when your volunteers were arrested.